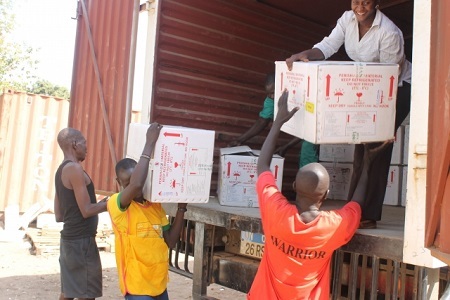 The World Health Organization (WHO) is working with the South Sudan Government and partners to provide vaccines to protect nearly 140 000 people living in temporary camps in South Sudan against cholera. The vaccines come from an emergency stockpile managed by WHO, the International Federation of the Red Cross and Red Crescent Societies (IFRC), Médecins Sans Frontières (MSF) and UNICEF. It is the first time the stockpile, created in 2013 by WHO, is being activated. Although currently there is not a cholera outbreak, people displaced by the recent conflict and living in the camps are at risk due to poor sanitary conditions and overcrowding. Starting today, 94 000 people will be vaccinated in the Minkaman camp, Awerial County, targeting displaced people and host communities, followed by vaccination campaigns in camps based in Juba, covering an additional 43 000 people. Two doses of vaccine are required for an individual to be protected. The campaign begins with an initial round of vaccinations followed by – after a required 14 day interval – a second round of doses, which will complete the vaccination. For such a campaign to be effective, it is vital that a second dose is administered and this factor has led to the decision to begin with Minkaman, Awerial County, and Juba camps. Cholera is an acute diarrhoeal infection caused by ingestion of contaminated food or water and affects children and adults. It can kill in a matter of hours due to rapid dehydration. Children are at a higher risk of infection. Once infected, in addition to dehydration, children develop severe hypoglycaemia that can lead to coma and death. Similarly, ‘at risk’ groups (for example malnourished people, the elderly, pregnant women, people with severe chronic disease, AIDS patients) are more likely to develop severe forms of the disease. Access to clean water and adequate sanitation remain the mainstays of preventing both endemic cholera and cholera outbreaks, together with health education to promote the adoption of appropriate hygiene practices. Cholera vaccination is a safe and effective additional tool that can be used under the right conditions to supplement existing priority cholera control measures. WHO will coordinate the campaign in collaboration with MSF and Medair as an implementing partner in Awerial and Juba respectively.